Bell Corner Cottage in Cratfield, Halesworth, Suffolk sleeps 4 people. This delightful, 18th-century traditional detached Suffolk cottage, with its open beams, inglenook fireplaces and pretty cottage garden, makes the perfect ‘away from it all’ holiday retreat. Set down a country lane, it is close to the heart of the village, yet surrounded by peaceful countryside and only 15 miles from the Suffolk Heritage Coast. Excellent for touring both Norfolk and Suffolk, it is also central for the Heart of Suffolk cycle route. Within ½ an hour’s drive is the Minsmere RSPB Reserve and Dunwich Heath (National Trust). Aldeburgh (15 miles) has a summer theatre and music festival. Pub in village. Beamed living room and dining-room with open fire in inglenook fireplaces. Kitchen with breakfast area and door to garden and patio. Bathroom/W.C. First floor: Heavily beamed double bedroom (5ft bed). Twin-bedded room. For a better idea of where Bell Corner Cottage is, you can see Bell Corner Cottage on the map below. 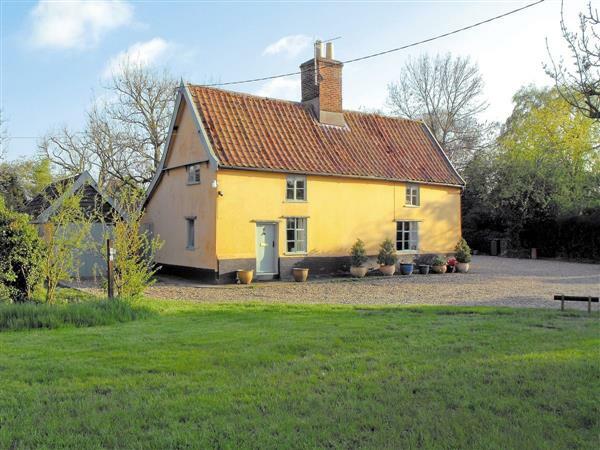 Bell Corner Cottage is in Suffolk; should you be on the lookout for a special offer, you can find all the special offers in Suffolk. It's always worth checking to see what is on offer at the moment. Do you want to holiday near Bell Corner Cottage (BJB), you can see other cottages within 25 miles of Bell Corner Cottage; have a look to find your perfect holiday location.